Just outside the town of Paulding, on Michigan's Upper Peninsula, lies a narrow valley lined with utility poles; at the end of Robbins Pond Road, facing north, on the edge of the horizon nestled inside the valley, every evening an eerily consistent spook light appears. It glows brightly, sometimes alternating colors, and appears to jump and dance in the distance. This has become known as the Paulding Light. The light has been a part of local folklore since at least 1966, when a group of teenagers reported it to the local sheriff. Legend has it that the mysterious light is the spectral lantern of a railroad worker who was killed trying to stop an oncoming train from hitting railway cars stopped on the tracks. Some witnesses have also reported seeing a dark, cloaked figure--reminiscent of the Grim Reaper--floating through the valley near the light; a fitting companion to the railroad worker's lingering spirit. Skeptics have attempted to explain the phenomenon with geologic activity, swamp gas, and most famously, car headlights. In 2010 a group of students from Michigan Technological University investigated the light, and determined it was caused by car headlights from nearby highway US-45. The group, led by then PhD candidate and current associate professor Jeremy Bos, said that when viewed through a telescope the light appeared as headlights. 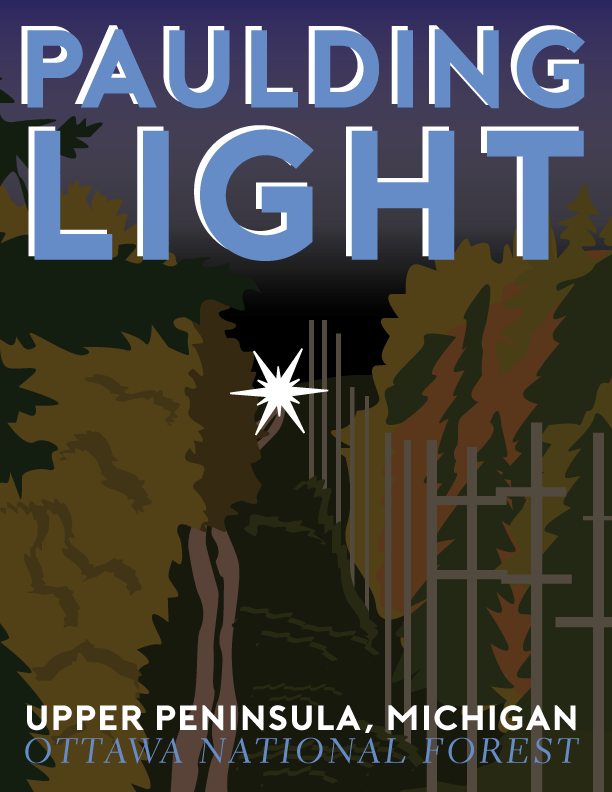 They split into two groups--one going to the spot on the highway from which the headlights appeared to be coming, and the other staying to view the ghost light--and reported that the Paulding Light would appear simultaneously to local traffic on US-45. The students even said that they were able to recreate the light by driving one of their own cars along the associated stretch of highway. They also concluded that heat rising from the pavement might contribute to the light's distortion, and that an inversion layer between the highway and Robbins Pond Road could create an area of extremely stable air capable of accounting for the light's visibility four and a half miles from US-45. Furthermore, the light's apparent movement was caused by a hill over which the highway runs, and an optical illusion whereby objects without a clear frame of reference seem to drift and float on the horizon; the different colors reported by witnesses merely represented the various hues found in the wide variety of car lights--from hazards to police lights. Despite this, many still believe in a paranormal explanation for the Paulding Light. “No matter what, some people will believe what they want to believe." So if you find yourself in the Northwoods and want to take part in a contentious mystery, then drive down lonely Robbins Pond Road and see for yourself--but if you find a ghost light accompanied by the Grim Reaper instead of the comforting mundanity of automobile headlights, well, you can't say you weren't warned.